Photo developer’s stamp on the back reads Wilkinson & C. / Kodak Department / Druggists / Keokuk, IA. Otherwise undated and unidentified. I’m assuming these are manual laborers taking a break from their toils, but beyond that I’m not sure what the story is. I thought the structure to the right might offer a clue, but I don’t know what it is. I was guessing maybe the base of a bridge or tower of some sort. So I looked up Keokuk, Iowa, and sure enough, not only is it located right on the Mississippi River, but it’s the location of a major lock and dam system, plus bridges for everything from cars to railroads. Apparently Keokuk is located at the base of the Des Moines Rapids, once the most impassable part of the Mississippi River, until the ambitious citizens of Keokuk decided to build a lock and dam system to make it navigable and draw business further upriver. (It didn’t turn Keokuk into the boomtown they hoped, but the system is still in operation, listed in the National Register of Historic Places, and run by the U.S. Army Corps of Engineers.) I was suddenly excited that these might be men building the dam or some related element of that project, but I’m not so sure. 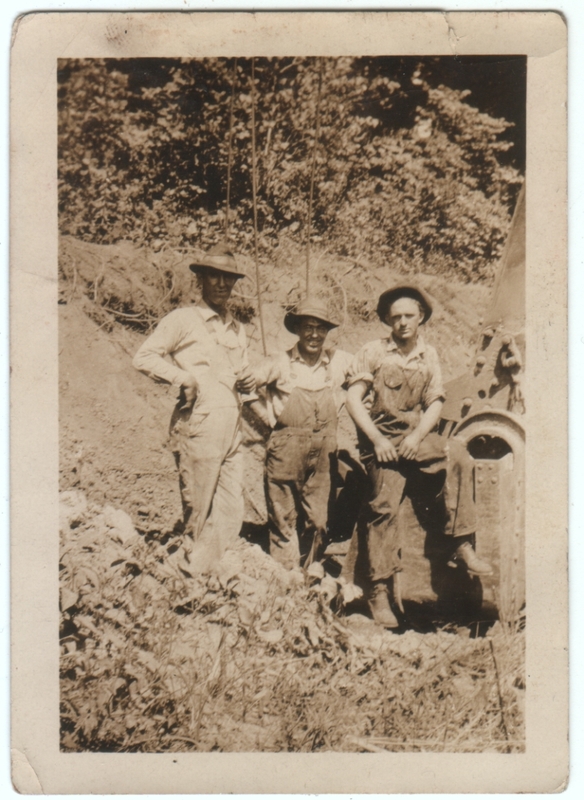 The dam was completed in 1913, and while the clothing here resembles that worn in photos of dam builders, and while the Wilkinson & Co Druggists was around back as far as the 1800s, this photo has more of a feel of the 1920s or 1930s to me. Still, as always, I could be wrong. Maybe they are later dam workers, not dam builders. Who knows? For all I know they could be farmers working in a field next to a radio tower. In any case, here they are for you to enjoy. Thanks! (I just found two [two!] typos and corrected them. Sheesh, I try to be so careful before I post.) The outfit on the left looked more like coveralls to me (as opposed to the overalls on the right), but it’s hard to say since the image is a little washed out. But you’re right, it’s different, and it appears cleaner, so he might be there in a different capacity. It’s always so interesting, the details that emerge the longer you look at an image. To my eye, they’re all in overalls and are, as you say, probably taking a break from work. I think the hats are our clue to era, and I just don’t know if those are 1920s hats. Anyone else out there specialize in accessories studies? I’m obviously not. There are definitely some clothing experts out there, I just don’t know if they’ll see this. Part of what made me think it was later was the format of the photo, the size of it, the slightly glossy surface and the stamp on the back. These things resembled photos I have from the 20s and 30s, but I could be wrong.